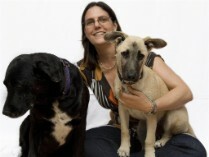 Otto's Adventure: looking for a pet/home sitter? It's always nice to go on holiday or on a long weekend away. But what about your furry life partners. In SA there's less opportunity to take your pets everywhere with you like in Germany. And going overseas chances are you'll leave them behind. Before going to Challenge Roth we were faced with exactly this dilemma. 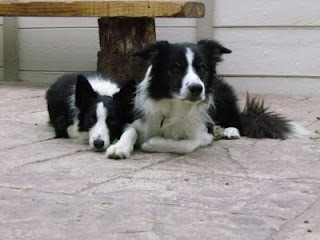 It would be to far out of the way for friends and family to look after the 3 Border Collies. Plus these fine creatures really need someone who understand their needs to take care of them. Anyone who ever had a Border Collie will confirm. We got a couple of contact numbers from the internet. But how do you swipe your card and trust a complete stranger to look after your extended family and house for 3 weeks while you are nowhere close? We tried to shortlist the contacts through our communications via email and telephone and then decided to see Angela from Home Sitters. We could see that she is used to handling dogs and it looked liked she had pet sitting experience as she also asked all the right questions, even about things we didn't even consider. Still, I think that she could have said what she wanted, but more importantly I wanted to see how my BC's interacted with her, especially Zeke. If Zeke is fine with her then chances are pretty good that she will take good care of them. Everything went well with the introduction and all 3 liked her. Sometimes you just have to take a chance and as time was running out we decided to go with Angela from Home Sitters. While were away we got almost daily emails telling us that our BC's and everything at home is fine. She fed them at night after work and also slept over at our house. In the mornings she left fresh water and pellets for them for during the day. When Zeke started itching she took her own initiative and treated him with a very effective spray. They got their weekly baths on the weekends. We arrived back home to find everthing in perfect order. She even left some doggie magazines. Although we would have been fine with it she took/used just about non of the food and no wine that was in the house. Angela was also very punctual with all her appointments and arrived at exactly 17:30 (the agreed time) to hand back the keys. We were very happy with the service from Angela (Home Sitters) and can highly recommend her. Although I was a bit hesitant to post this on the internet as she will be in higher demand and it will make it more difficult for myself to book her, I'm sure it's in the best interest of all of our pets. Angela operates in the Parklands and surrounding areas, but Home Sitters have agents all over Cape Town and also Pretoria. Dalk verdien sy regtig om nog meer kliënte te kry. Bly dit gaan so goed met die driemanskap.